If you have ever been to Sicily in the summer time you will be familiar with the scene – people lined at the local bars in the morning enjoying granita with a brioche for breakfast. In a land where summers can get very hot, tradition calls for an icy granita coupled with a warm, just baked brioche in the morning to wake up the senses. This popular semi-frozen sweet treat that is half dessert, half breakfast is often referred to as granita Siciliana, because, as you guessed, is a specialty from the region of Sicily. Granita dates back to the Arab invasion in Sicily, when the invaders brought with them the recipe for sherbet, an iced drink flavoured with fruit juice or rose water. Sicilians over time adopted the recipe with the preference for flavours developed with local produce, and naturally, lemons became an obvious and popular choice due to its abundance and quality in the region. 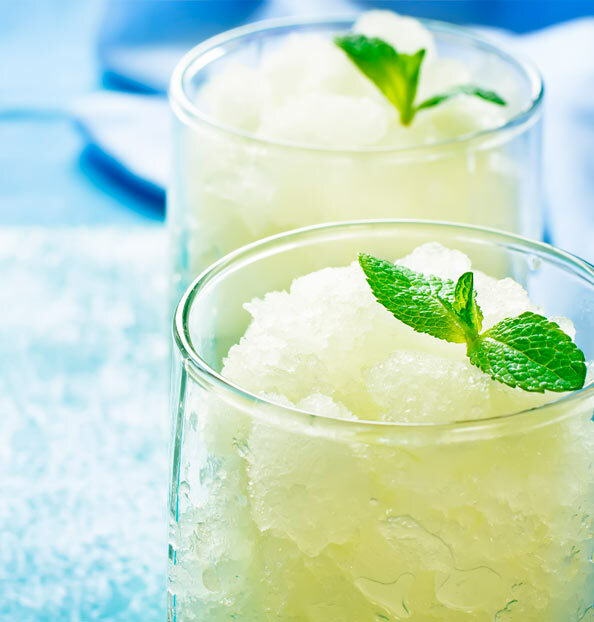 Traditional flavours of granita are lemon, almond, coffee, and chocolate, and whilst everyone has their own favourite, the most popular of these is undoubtedly lemon granita. An irresistibly fresh taste that is loved by everyone, young and old, especially when made from fragrant sun-ripened Mediterranean lemons. A lemon granita is a refreshment of choice at any time of the day. In Italy, a land full of traditions and rituals, one ritual involving granita is observed at the end of a seafood meal – it is common practice for Italians to have a lemon granita afterwards to ‘sciacquare la bocca’, that is, to cleanse the palette. The most practical and delicious way to round off a meal and a good excuse to enjoy this delicious treat. Sicilians are very serious about their granita, and celebrate this local specialty with a festival dedicated to the icy stuff: the Nivarata International Festival of Sicilian Granita. Attracting visitors from far and wide, this is an excellent chance to taste some true Sicilian flavours. Make sure to do it like a local – stop everything for half an hour, and savour the creamy cool taste that melts in your mouth, because a granita is more than just a snack, it’s a ritual!